Vacation preparations are ramping up, chez Momogus! I had to renew my driver's license today, and, well, the Driver's License Center is right across the street from Justa Knitting Basket, so of course I had to drop in. They carry Momogus Knits patterns, so I wanted to pop in and chat up the owner, the really really nice Marie Matthews. Marie is great and her store carries great stuff, so please pay her a visit if you're ever around Huntingdon Valley. I succumbed to the siren song of the contraband Kureyon (for the Fake Isle Hat) and picked up two books. 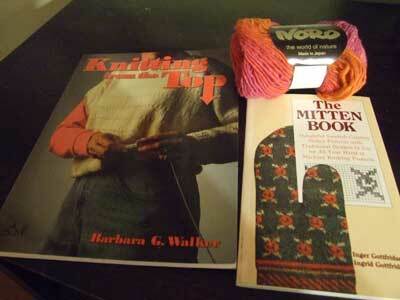 May I just say, why have I never read "Knitting From the Top"??? I worship Barbara Walker like a god. I have all her other books, but not this one. Within one paragraph I was hooked. She's even more empowering than Elizabeth Zimmerman. Speaking of whom, I watched an episode of "Knitting Workshop" (DVD Xmas present) this morning. OH MY GOD. I could listen to that lady forever. It's funny - I've read every word she's ever written a thousand times over and had never seen or heard her (which of course is not that odd, since she's been dead for 10 years, but still....) She was even better than I had imagined she might be. And I think I heard Meg Swansen's voice in the background. 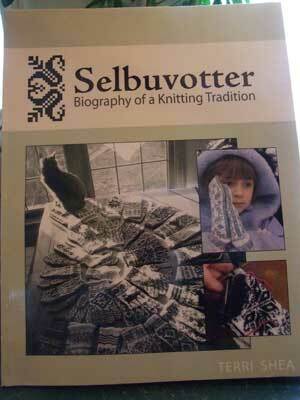 Knitters out there, save up your pennies and get this DVD. 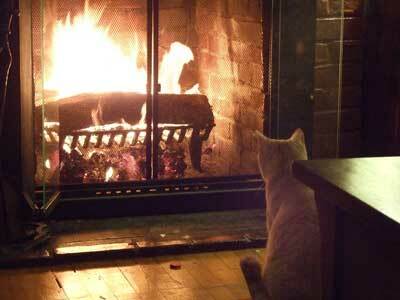 You cannot imagine how wonderful it is. 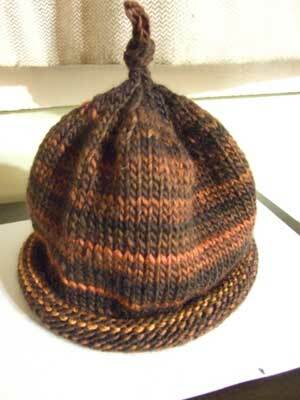 For all my talk of wanting to knit fussy, complicated stuff, I have to admit it was nice just to whip out a hat in an evening. So we're off to Montauk tomorrow. I am tendinitis-free this year and have A LOT of knitting planned. Yippeeeeee!!! Boy oh boy, how I loved knitting this. I finished "The Corrections" yesterday. I wouldn't say that it was the most pleasant book I've ever read (and I put a high price on pleasant), but I'm glad I read it. The characters seemed despicable at first, but Franzen made them much more believable and sympathetic by the end. I cared what happened to them. I have to admit it was kind of a tour de force to weave all the stories together so well. So anyway, that was my venture into literature. I'm going to re-read Harry Potter #7 now, since I read it so fast when it came out I didn't properly let it sink in. Somebody asked me a question about it at the store the other day, and I couldn't remember anything about it except the ending. Okay, so I couldn't stand it any longer. 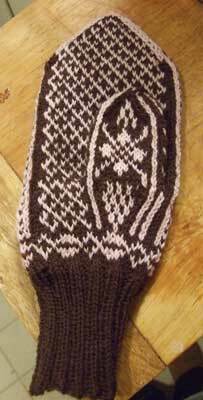 I started my first Selbuvotter mitten. This is NHM [Nordic History Museum] #3. It doesn't show up that well in the picture, but it's a pretty, leafy pattern. 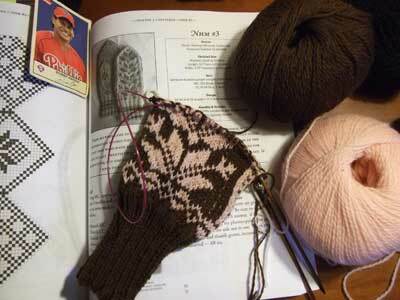 I am doing it in pink and brown KnitPicks Palette on #2 needles. I reversed the light/dark chart because I don't like a light mitten. I also omitted the sporty stripes on the cuff because, well, I didn't like them. It is heavenly to knit, watching the pattern grow, moving my fussy little post-it note every 64 stitches. I was speculating today whether it's a seasonal thing - I seem to like to do nutso-complicated, concentrating-heavy projects when it's really cold out, and no-brainer stuff when it's warmer out. I guess that makes sense - does anyone else out there have the same experience? 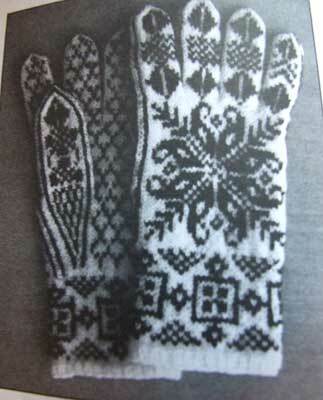 Don't want to drive all the non-knitters away with my insane obsession with Norwegian mittens, so I'm offering up some winter sports content. It's hoops season around here. Gus is on the Pacers, and they had their first game last week. They looked like a crazy disorganized mess during practice, but they came together like a well-oiled machine for the game and beat the Rockets 18-14. 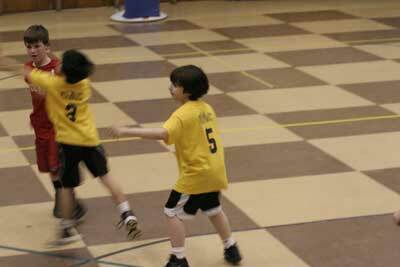 Gus's favorite sport is still baseball, but I think because he has lower expectations for basketball and because it's not a sport that focuses so intensely on individual performance, he relaxed and had a great time. He had an assist, a steal, some boards, and led cheers for the team when he was off the court. I didn't bring my camera so I didn't get my usual 10,000 pictures, but I'll bring it the next time. I made myself kick my Georgette Heyer habit for the nonce and am reading "The Corrections" by Jonathan Franzen. I wouldn't say it's exactly enjoyable reading because the characters are not particularly likable, but they are compellingly-written, in a car-crash kind of way. 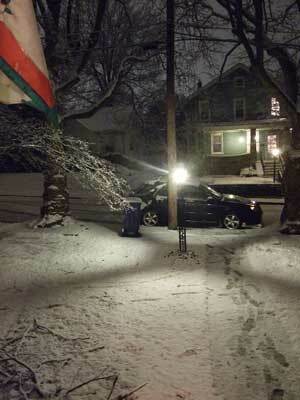 And because part of it is set in Chestnut Hill, there is much that is verrrrry familiar. Has anyone read this book? I remember there was a bunch of kerfluffle over it when it came out because Oprah picked it for her book club and then Jonathan Franzen said he didn't want it to be picked. I can't remember what the outcome was. My copy has a "Oprah's Book Club!" sticker on it, but I bought it for 50 cents at the library so that doesn't help me. Anyway, I feel like a grown-up for reading a "real" book, even if I'm seven years late to the party. Having finished off the Wintergreen Mittens and gotten halfway through the second Bird in Hand mitten, I felt that I had finally kicked my mitten habit. 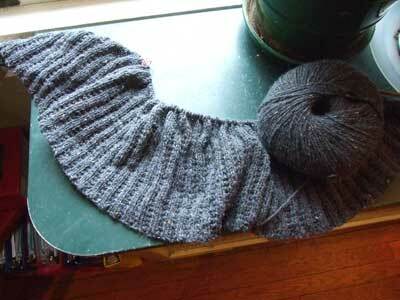 So I picked up my Tangled Yoke Cardigan and finished the 6" of ribbing and got into the (endless) stockinette. Love the Felted Tweed (it's like a thicker Scottish Tweed 4-ply!! yippee!) and by doing the body in one piece I feel like I'm making some real progress. 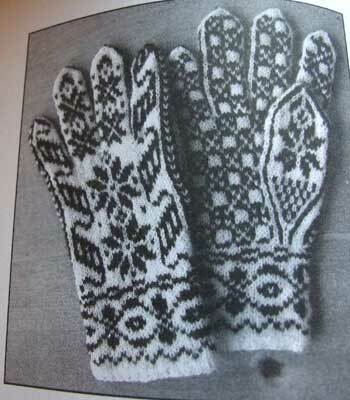 There are 31 patterns in this book for gloves and mittens, and they are ALL dementedly beautiful and EXACTLY what I've always yearned for, and I want to make EVERY SINGLE ONE OF THEM. PHEW. 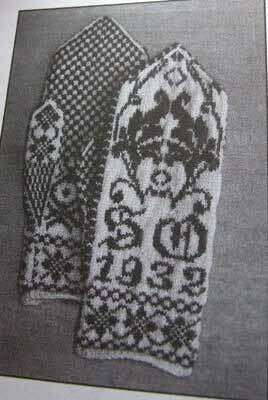 I can't believe this book - I've never had a book where I wanted to make every single pattern. 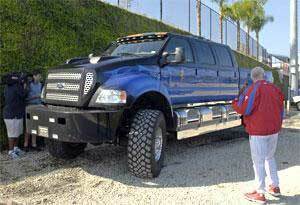 God bless you, Terri Shea!!! Oh how I loved everything about this project (once I got the hang of the two-color twisted stitches)! I loved learning a new technique, and I loved this ding-dang yarn. Last year, Annie and I were looking at the Rowan color card for Scottish Tweed at the store, and a favorite customer (who happens to be from the Hebrides) came in. She pointed at a color named 'Machair' and said, "Oh, that's near my home town." I said, "Oh, you're from MACK-AIR? [feeble attempt at true Gaelic pronounciation]" and she said, "It's pronounced 'Murrraaaggghhh....' [suddenly evoking mist and waves breaking over the rocky Hebridean coastline]" Annie and I were struck dumb with awe. We still talk about it. We toy with the idea of asking her to read the color card to us every time she comes in, in the manner of a soothing bedtime story, but figure it might creep her out. Love love love. 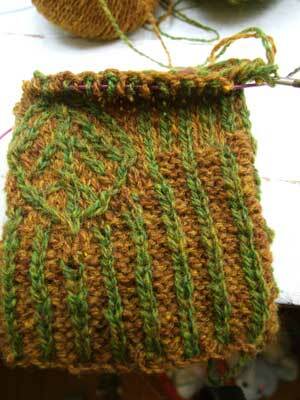 I've cast on for the second one, because I sense I'm heading for Second Mitten Syndrome. 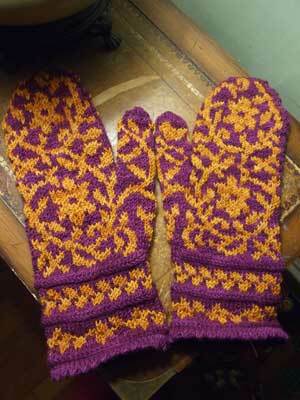 I was over at Crossroad Knits and saw Liz's beauteous Herringbone Mitts and was smitten. 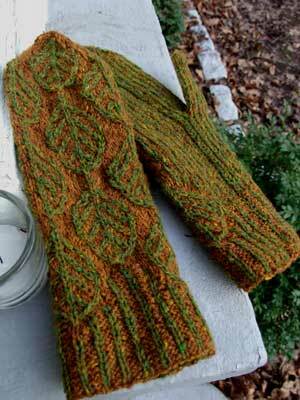 The pattern would be perfect for the red and orange Cascade 220 that I originally intended for the Wintergreen Mittens before I came to my senses. What?! What the $&#*??? 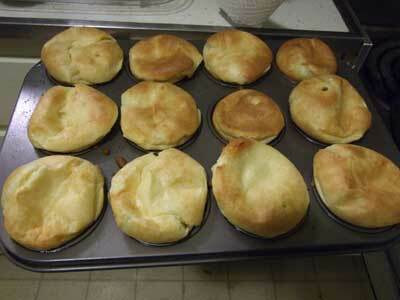 Are they really "timeless and universally-appealing"? I don't think so! 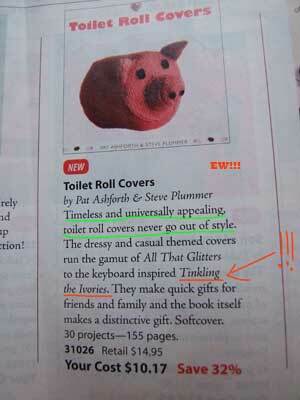 And a toilet roll cover pattern called "Tinkling The Ivories"???!!! I don't care if it's "keyboard-inspired"! EWWWWW!!!! HEY! How've you been since last year?? WA HA HA HA - I never get tired of that joke. Good riddance to 2007, not one of my favorite years BY FAR. Here's to a fresh and FABULOUS 2008!! 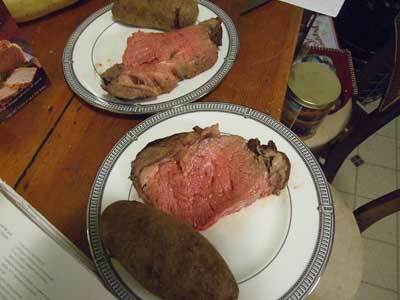 for dinner last night, both new dishes for Matthew and me to cook, respectively. Both turned out great. Gus stayed up until midnight, for the first time, which thrilled him, though I faded out at about 11:15, and he had to wake me up at midnight, shouting, "TEN... NINE... EIGHT... SEVEN..." in my ear, which was quite startling. I lurve how the Scottish Tweed is coming out - it's so extra-SUPER-tweedy!! 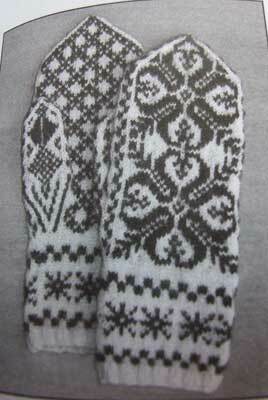 I really should be knitting my Tangled Yoke cardigan, but the siren song of these two fabulous pairs of mittens is too strong for me right now. Why fight it? Hey, does anyone have any New Year's resolutions, knitting or otherwise, that they'd like to share? I love the idea of starting fresh on New Year's, but I can't think of any particular resolutions I have this year, other than to lighten up in general. Life's too short to be sweating everything, for sure! !